Spencer Carter is engaged with ongoing research into the Mesolithic period of north-east Yorkshire and the North York Moors. The North York Moors is the backdrop for one of the densest concentrations of Mesolithic lithic scatters in the UK based on current evidence – second only to the Central Pennines – and yet it is one of the least understood. 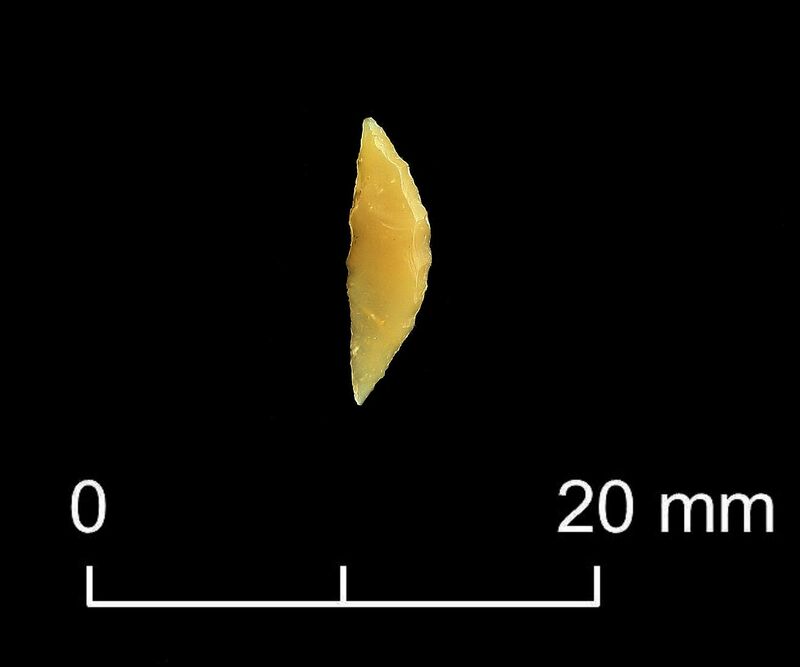 The emerging results from on-going analyses of artefacts recorded during a systematic rescue excavation of a typologically Late Mesolithic upland lithic scatter at White Gill¹ are compelling. The excavation provides unequivocal evidence of hearth features and burning episodes associated with discrete lithic knapping and deposition events, artefact associations with flat-stones, and a tentative structure. The early results reveal complex chaînes opératoires including the possible expedient re-use of legacy lithic material. There are now ten AMS radiocarbon determinations from White Gill, the latter three generously grant-funded by the National Park Authority, and thirteen overall for the immediate area. These provide the first and only cohesive calibrated sequence for north-east Yorkshire outside the research focus on Star Carr and the Lake Flixton area in the Vale of Pickering. The latest White Gill dates, based on short-lived Corylus avellana (hazel), seems to relate to transitional Terminal Mesolithic to Early Neolithic activity (or at least a terminus post quem burning event) in what appears to be extended Late Mesolithic persistence into the fourth millennium cal BC – a short period where there is also evidence for an Early Neolithic mortuary structure and domestic activity (the latter securely dated in 2016) in the coastal zone at Street House, Loftus. 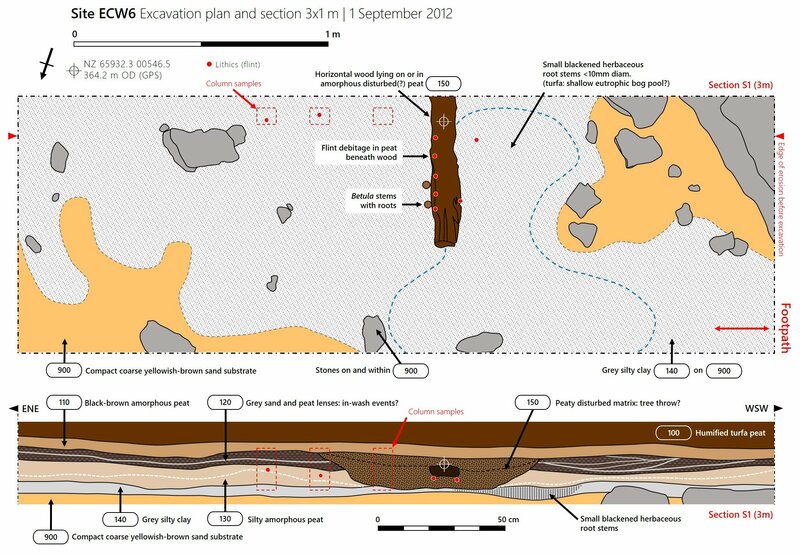 In addition, evidence is emerging for possible coeval site “pairing” suggested by lithic re-fits between neighbouring assemblages (better termed surface ‘collections’), along with three new radiocarbon dates and a full palaeo-environmental sequence, at Esklets, a few kilometres to the south in the proximity of a small palaeolake that was a body of open water throughout the Mesolithic². The transport of lithic raw materials over considerable distances including the presence of finished Pennine chert tools, white flint from the south-east, and possible stained flint sourced from the Trent basin. 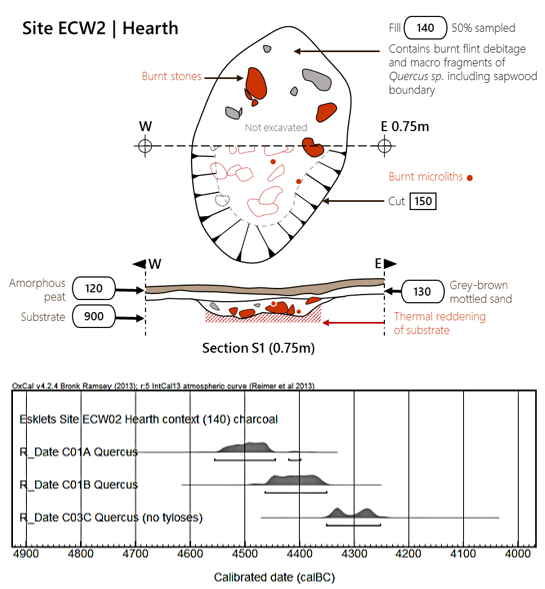 Isolated lithic finds and possible caching events are also included, extending to the Glaisdale area where palaeo-environmental sequences – with posited periodic anthropogenic burning events – are also well defined. Rescue excavation of an eroding footpath has revealed in situ Late Mesolithic flint debris and tools, together with a full environmental sequence from the Mesolithic into the Neolithic and Bronze Age². Anthropogenic signatures are evident in pollen cores, demonstrating different degrees of direct and indirect impact on the landscape. The project therefore affords a rare opportunity to analyse activity and mobility through time and over distance. 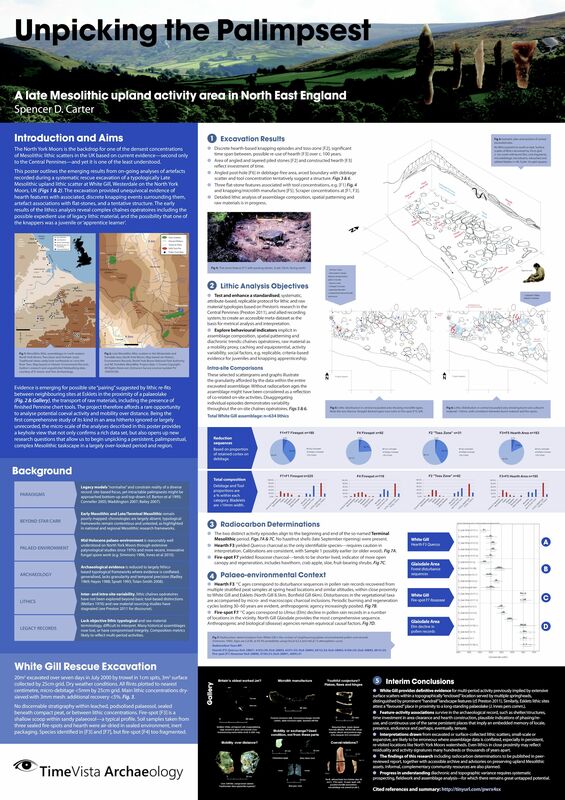 Being the first comprehensive study of its kind in an area hitherto ignored or largely unrecorded, the micro-scale ‘bottom-up’ analyses provide a keyhole view that not only confirms a rich data set – albeit it one at risk from erosion and land management practices – but also opens up new research questions that allow us to begin to unpick a persistent, palimpsestual, complex Mesolithic taskscape in a largely over-looked period and region. ¹ Carter, S.D. 2014. 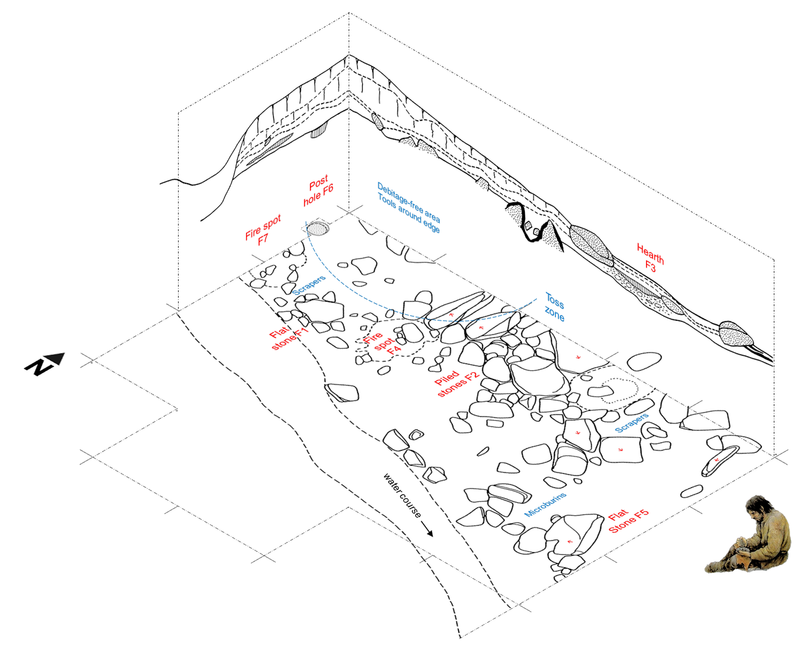 Unpicking the Palimpsest: a late Mesolithic upland activity area in North East England. Poster presentation at Where the Wild Things Are: Recent Advances in Palaeolithic and Mesolithic Research Conference, 8-10 Jan 2014, University of Durham [Online paper: academia.edu, includes handout with bibliography³]. ³ Please note that the most recent radiocarbon determinations are not included, pending Bayesian modeling and further analysis of the lithic material culture.